Tickets for the Bristol International Comic Expo in May are now on sale - and in a special IN FIRST offer, if you buy now, before 30th January, you pay only the 2010 admission price. "As you recall, we sold out last year," says organiser Mike Allwood, "and while we have expanded the event capacity, demand will once again be high, so pre-booking and a special low entry deal guarantees you can't miss out on the UK's Premier Comic Event." The Bristol International Comic Expo runs from 14-15th May 2011, with the convention being held at the Ramada City Inn & the Mercure Holland House Hotels. Plans are underway to bring the usual high octane mix of international guests, interactive panels, European Showcase, Big on Small Press, New Title launches and those ever collectable EXpo EXclusives. The international guest list already includes Rick Veitch and Ron Marz, who will be helping celebrate the 40th anniversary of Swamp Thing and previewing the Green Lantern movie. Also look out for a very special EXpo EXclusive as the Expo wishes the Watchmen a happy 25th birthday with Dave Gibbons and John Higgins, who are together again for the first time on something just a bit special as the event supports its regular charity. Rogue Trooper - the world's greatest Genetic Infantryman - also celebrates his 30th birthday at Expo thanks to John McCrea, who is producing a Signed and Numbered Limited Edition Print which will also feature another legend from 2000AD. "You will not want to miss this one," hints Mike. "it's the law!" EXpo EXclusives launches from publishers Self Made Hero as they debut their take on HP Lovecraft plus Dalen Books Druids Volume 2. Top creator guests are confirmed so far are Alan Davis, Mark Buckingham, Charles Adlard, Lee Garbett, Ian Churchill, Gary Erskine, Ian Edgington, David Hine, Shaky Kane, Mike Ploog, Dylan Teague, Al Davison, Mike Collins and John Watson, with many more to be confirmed. EXpo EXhibitors include ComX, Ace Comics, Forbidden Planet London, Incognito Comics, Panini, Reed Comics, Markosia, Self Made Hero, PsiCollectables, The Comic Man, Astral Gypsy and Tripwire. Also in the New EXpanded EXpo European Showcase are Cinebook plus Dalen Books. 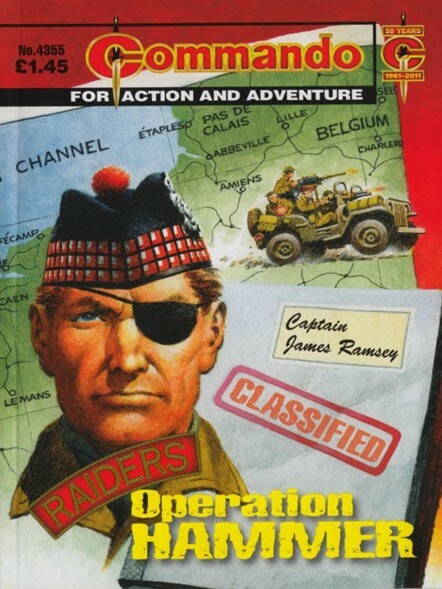 Commando comic is fifty years old this year - in the UK only the Dandy and the Beano are older than it - and since there are eight Commandos a month it has by far the highest issue count of any British comic ever published. It wasn't the first digest size war comic but, with its logo incorporating the Fairbairn-Sykes Fighting Knife and its striking covers by the likes of artists Ken Barr and Ian Kennedy, it has become the iconic British war comic. Current Commando editor Calum Laird has always been generous with his time for us on downthetubes but has gone above and beyond the call of duty during his Christmas holidays to talk to Jeremy Briggs about the anniversary and future plans for the title. DTT: 2011 is Commando's 50th anniversary, will the title be celebrating the fact or will it be business as usual? Calum Laird: The answer, I’m pleased to say, is both! We’ll have 48 brand-new titles as normal. Some of these will be tied to historical events and one has been specially written as an anniversary issue. Others will feature popular Commando characters making another appearance - including Ramsey’s Raiders and The Headline Heroes. Plus writer Alan Hebden has created a new group of characters -The Convict Commandos. That’s the business as usual. The celebrating will be the programme of re-issues throughout the year. We’ll be reprinting the first dozen stories - starting with No12 - and myself, deputy editor Scott Montgomery, former editor George Low and a couple of other folks will be choosing their best-remembered titles for another airing. Some of these go right back into Commando’s history. It was brilliant to have an excuse to re-read all the old titles I’d first bought in the 60s and 70s once more. And to pretend it was real work. DTT: For readers the format of 63 pages of B&W combat adventure behind a colour cover does not appear to have changed since 1961. Indeed the only major changes seem to have been the recent introduction of the Credit Grenade and some colour advertising on the inside covers. From an editorial and production point of view have there been any major changes behind the scenes over the years? Calum: The format is very much as it was because we’ve stuck to the adage, “if it ain’t broke, don’t fix it.” All our stories still come from outside contributors which is exactly as it was. Behind the scenes, though, there have been many changes, principally as a result of advances in technology. One for instance is the process of putting the type and the art together. Back in the days of Issue 1 this was done using an electric typewriter to put the type on sheets of glossy paper. The balloon shapes were drawn round the words, then cut out and stuck on to the artwork with added tails. Over the years, this was changed as new machines became available to set the type. Nowadays, the artwork is untouched by the text as it is scanned and the resulting digital files have the balloons and panels added in QuarkXPress. The changes have been more evolution than revolution and it’s only when someone (like yourself) asks a question that you realise how much things have altered. One thing that will never alter is the importance we place on the stories, they are central to everything Commando is. DTT: The mammoth Commando reprint books published by Carlton over the last few years have obviously been very popular. Will these be continuing? Calum: Absolutely. We‘ll be collaborating with Carlton on another collection (Rogue Raiders), perhaps two, and on another product which will see three classic Commandos bound together in one cover. A set of four of these should be out around Easter time 2011. There is another project we’d like to get off the ground but it’s early days with that yet. DTT: Along with the Carlton books appearing in the shops, in the last few years Commando's web presence has increased noticeably with the Commando website appearing plus new release information regularly on various websites. More recently Commando is now on Facebook and your official website has recently had a major upgrade with more covers and writer and artist credits than ever before plus a selection of new merchandise. What was the inspiration behind the website update? Calum: The site commandocomics.com has been redesigned to give Commando readers a better opportunity to look back into our past…and forward into our future via our up-coming digital subscription service (any day now…) to run alongside our existing subs service. Being 50 years old means you’ve got a lot of history. Having a digital subscription should mean we’ve got a lot of future as well. It also gives us the chance to provide some of the other things we’ve been asked for over the years, like the new cover posters, for instance. As time goes on, more merchandising should be added to give our loyal fans more and better service. With the Facebook page we should also be able to keep readers informed of what’s happening on a much more immediate basis and to find out how we can better supply just what they’re after. 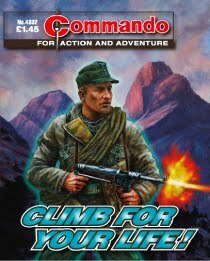 DTT: As well as various lengths of subscription to the print version, the website is now giving the option to receive Commando electronically. While other UK publishers have this as an option, notably Rebellion's 2000AD, is this the first time that DC Thomson have offered one of their publications this way? Calum: You’re right, this is the first time any DCT product has been available as a digital download subscription. It’s very exciting to be chosen to take the lead but it does make us a little nervous in case it doesn’t work. However, we’re confident that there will be a good take-up as we have been getting increasing numbers of e-mails asking for this kind of delivery. DTT: 2010 has been a sad year for Commando with the death of artist Jose Maria Jorge whose aviation stories were fan favourites, yet it has also been noticeable for the rise of the impressive covers by relative newcomer Janek Matysiak. Does Commando continue to look for new writing and artistic talent? Calum: Josè Maria’s death was a blow, especially after losing Ricardo Garijo almost exactly a year before. They had grown to be friends as well as colleagues and their loss is very deeply felt. Janek drew for us a number of years ago but stopped contributing some time ago when he returned to university to retrain in digital art. With his new expertise, he was able to move into the video games arena doing concept art. He still had some spare time, though, and I invited him to try a Commando cover. This was a success so he has joined our regular roster of artists once more, though now he doesn’t tackle inside art. DTT: British comics have had a hard time of it in the 21st century with sales continuing to fall and the loss of even more titles in 2010, including Thomson's Classics From The Comics and the Beano and Dandy Fun Sizes. 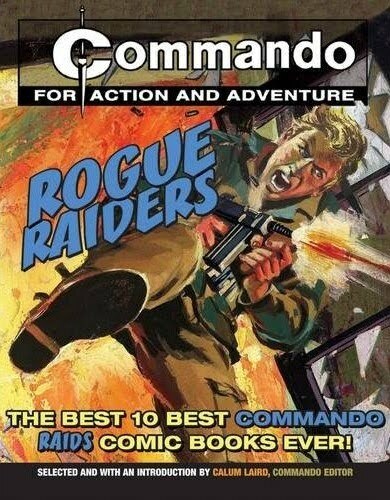 How healthy are sales of Commando and do you expect the title to still be here in 2012? Calum: We’d better be still here in 2012, I’ve got ages to go before my pension! And lots more ideas to work on. Commando’s figures are nothing like as high as they were back in our heyday of the 60s, 70s and 80s. However they are holding steady in a falling market and plainly good enough for us to invest heavily in our new website, develop the e-commerce associated with it and go as far as sorting out an app to bring Commando to digital platforms. 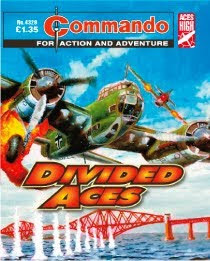 If Commando was not expected to make it through to 2012, DC Thomson would not be doing that. DTT: Do you have a New Year's message for your readers? Calum: If I could I’d like to spread that message out to thank everybody in the extended Commando family - from writers and artists to everybody who helps get Commando into the hands (or on to the screens) of our readers - for their efforts this and every year. I also have to pick out one person without whose contribution my work would be impossible - deputy editor Scott Montgomery. As well as the work he does himself in getting our 6,000+ pages out every year, he’s very good at keeping my mind on the job in hand! Last I’d like to say to our readers that I hope you’ll enjoy what we’ll be doing this coming year. I’d love to hear what you think of our programme and our new website. Send me a message through the Commando website, my Inbox is always open. The newly updated Commando website is at commandocomics.com and the Commando Facebook page is here. You can read career interviews with Calum Laird along with former editor George Low, deputy editor Scott Montgomery and Ramsey's Raiders writer Ferg Handley, on the downthetubes main site. Commando ® is TM© DC Thomson & Co. Ltd. 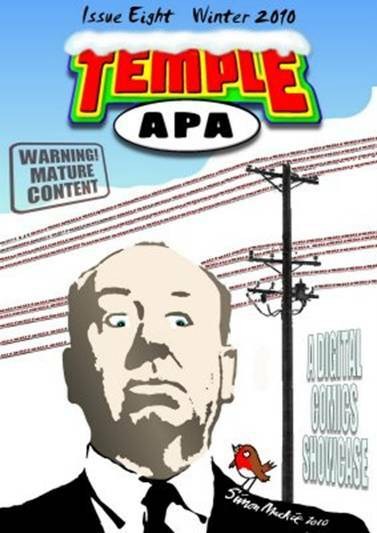 The lightly seasoned Eighth Issue of the Temple APA digital comics showcase is now available to download as a completely free pdf file. Full of comicy goodness from such persons as Simon Mackie, (also responsible for the cover shown above), David Hailwood, Matthew McLaughlin, Dirk Van Dom, Tony Suleri, Derek Hamill and numerous others including Malcolm Kirk, who cobbled it all together. 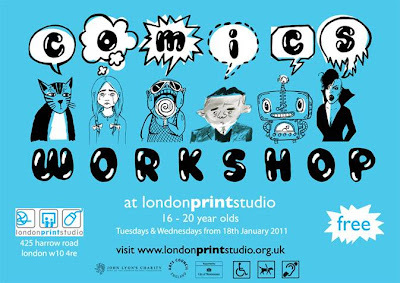 londonprintstudio is running free workshops in 'Comics and Comic Production' this year for 16-20 year olds on Tuesdays and Wednesdays from 5-7.00pm, led by industry professionals and comic interns. Part of the londonprintstudio comic collective project, artist Karrie Fransmen tells us it's funded by the John Lyon's Charity so it's an excellent opportunity to pick up some tips and trick of the trade. The first workshop is on 18th January with a session from screenwriter Ben Davies on developing characters, narrative and story arcs and there are events coming up with Woodrow Phoenix in February and Al Davison in March. Call 020 8969 3247 to book a place or pop in. There is a £5 booking fee but it will be entirely reinbursed when you turn up. From scores of high quality applicants, a group of young graduates - Karrie Fransmen, Isabel Greenberg, Freya Harrison, Joe Kelly, Rachel Emily Taylor and William Goldsmith - were chosen to showcase the best of young British comic talent at the londonprintstuido. For six months they will be interning at the studio, working on an ambitious comics anthology and running workshops for young members of the local community. • There's more information about the project at: http://londonprintstudiocomics.blogspot.com - or join this Facebook group. As part of their 'First Fridays' events, Marine Studios in Margate are putting together an exhibition that looks at comics, graphic novels and sequential art. Featuring work from a range of local and international artists and writers, live talk from guest speaker Paul Gravett, more comics than you can stand, and the chance to discuss your work and ideas. To kick start proceedings prior to the show they are inviting submissions for a 'Two Page Comic'. The task: to create a two page comic under the title: 'Mechanical Elephant'. All ideas are welcome to inspire, amuse, terrify and entertain. There are no limits other than sticking to the two page rule (206 x 280 mm each, in either portrait or landscape), and of course, don't forget the Mechanical Elephant! The deadline for entries is 21st January 2011. Marine Studios will display the finished artwork and as much of the preparatory work as possible in their show beginning 4th February 2011 at Marine Studios, Margate.